Southern food has had a hard time taking off in Hong Kong. The American comfort experience has been tried across the city but has rarely been a smash hit success. 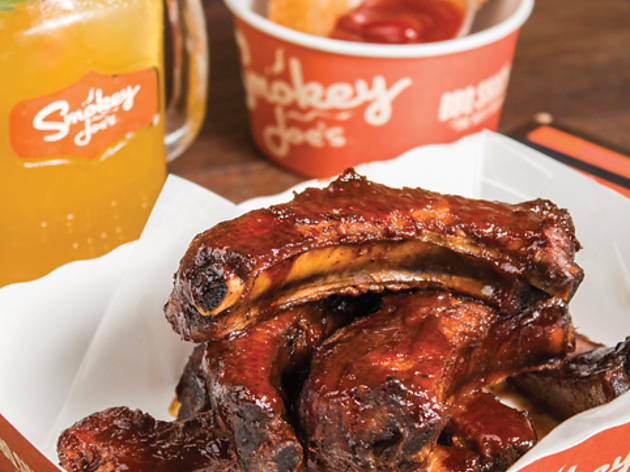 Smokey Joe’s, though, is set to change all this. 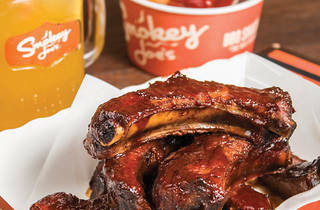 Although ribs, pulled pork sandwiches and corn cobs alone are great, a true taste of the South needs to be in back-to-basics surrounds – think cookouts and shack barbecues – and needs to be in the lively company of friends and beers. And this is just what Eclipse Group is knocking up on Elgin Street. There isn’t too much going on with the décor at Smokey Joe’s. But that’s the point. There’s a TV in a corner, the surrounds are sparse and the food is served simply on paper plates. So, the food. We dig into a hickory smoked pulled pork sandwich ($78), as well as a side of fried okra ($48) and some cabbage and carrot slaw ($48). The toasted sandwich bread elevates the smoky aromas of the succulent pork and the sensational barbecue sauce – and we love the spices that are packed in the battered okra. The cabbage and the carrots in the slaw, though, are grated too finely for the mayo, creating a sad and limp salad. While the ribs ($138 for a large portion) are smothered in a tangy sauce, the meat is a bit dry and stringy. Smokey Joe’s 38 Elgin St, Central, 2530 5885; wwww.eclipse.com.hk. Dinner for two: $500.